Jio Chairman Mukesh Ambani announced a press release yesterday that the company extends the time for Jio Prime subscription. Most of the users are unable to register prime service on the last day because of system errors. Here is the good news for the Jio users, Now Jio extended the last date for Jio Prime subscription till April 15th. Users can continue their Jio free services and decide whether to opt for Jio Prime or not within the last date. Jio now has over 72 million customers and this is the largest migration from free to paid services in a short period. 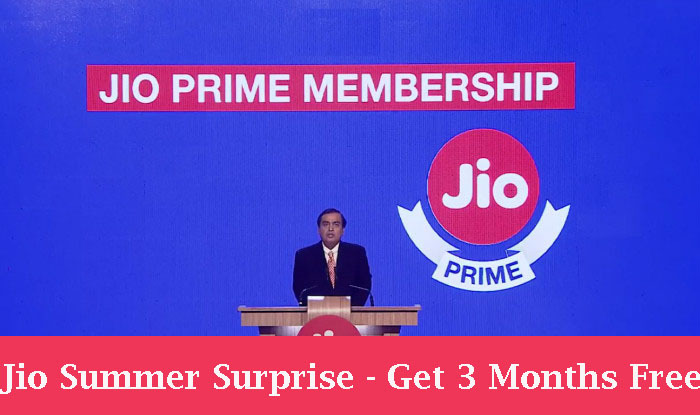 Reliance targets more customers to join into the Prime service, the company also announced Summer Surprise offer for Jio Prime Users. 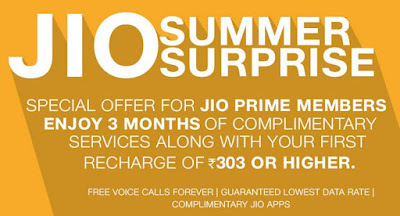 Also Reliance Jio announced a special summer surprise offer for 3 months if you recharge for Rs.303 after your Jio Prime Subscription. • To get this offer, you have to join as a Jio Prime member to Pay Rs.99 before April 15. • Additionally you will get one month plan for your original recharge. So you can continue Jio unlimited services till July month. • Users can get 1 GB mobile internet per day, 100 SMS per day, unlimited calls and free access to the Jio apps such as Jio TV and Jio Music. * TRAI advices Jio to withdraw 3 months complimentary offer. * Jio Summer surprise offer to be withdrawn in the next few days. * All customers who subscribe before discontinuation will remain eligible for the offer.